Looking towards the fruit/vegetable garden. chairs, sun parasol and barbeque. settee (163 x 70 cms ) which can be used as a child’s bed. and gas hob, toaster, coffee maker and kettle. double bed (190 x 140 cms) and wardrobe. with baby and small child maximum. The Terrace looking towards Rue du Pont. There is a table, four chairs, sun parasol and a portable B.B.Q for sole use of this studio on the terrace for ‘al fresco’ dining. a dining table and four chairs and a sofabed. 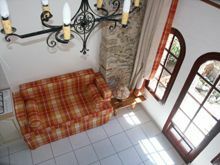 The Sitting area looks out on the church and bell tower whilst the kitchen area overlooks the terrace.There is a wardrobe and sideboard with ample storage space, Sky TV (French and English) and ipod/iphone docking station provided. The Kitchen is fully fitted with electric oven and gas hob. kettle, coffee maker and a large fridge/freezer. downstairs in the lobby area. 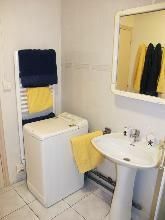 Separate shower room with large shower cubicle, toilet, hand basin and washing machine. 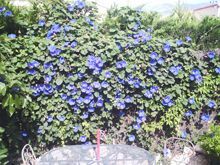 L'HIBISCUS is suitable for a couple and a child and baby maximum. Additionally a cot can be supplied if required. Air conditioning/heating is installed. the side of the main house with a private front door next to the entrance to L'Hibiscus. 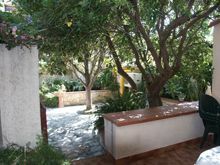 The front entrance door leads into a long corridor with a toilet, fitted vanitory unit, storage unit and fridge for your drinks on the terrace and/or use in conjunction with the optional ground floor bed/sitting room. There is an access door direct to the optional ground floor bed/sitting room. 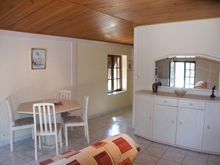 Kitchen/dining/lounge area of the gite. The lounge/dining area has double French windows looking out onto the church, bell tower and college. Sky TV (French and English), cd/radio/cassette player and ipod/iphone docking station are provided. There is a large dining table with six chairs and a sideboard. More dining chairs are available if required when the ground floor bed/sitting room is also in use. convertible settee (190 x 140 cms). kettle, iron and ironing board and washing machine. and hand basin is also accessed from the kitchen area. provided when the Annex is in use. can have their own bedroom. sleeps up to an additional 4 people. Large bed/sitting room (18 sq. metres) on the ground floor. There is ample wardrobe/drawer space. A toaster, coffee maker and kettle together with associated crockery, cd/radio/cassette player are provided. 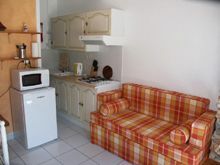 Kitchen facilities are shared with La Bougainvillea although the entrance corridor does have a fitted vanitory unit, seperate toilet, storage unit and fridge. 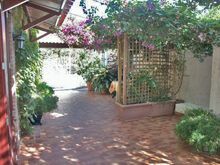 Shower facilities are shared with La Bougainvillea. single bed (190 x 90 cms) and sofabed.